The Update tab allows you enable/disable the CIS program updates and to select the host from which the updates are to be downloaded. By default, the URL of the Comodo Server is entered as an available host. 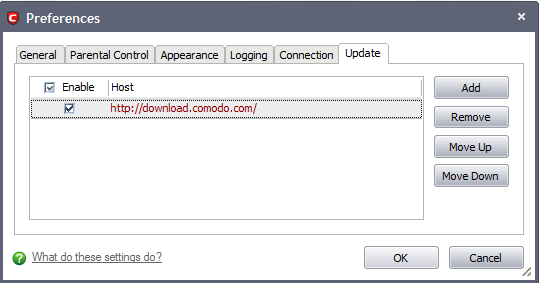 If you want to download the updates always from the Comodo servers, you can leave the setting as it is (Default = Enabled). If you are connected to a local network and the CIS program updates are available at an HTTP Server or at any of the other computers in your network running Comodo Offline Updater, you can add the computers as hosts in this area. To add a host click 'Add' and enter the url or IP address of the host in the next row that appears. Repeat the process for adding multiple hosts. Select the host by using the Move Up and Move Down buttons. CIS will automatically check the host specified here and download the updates from the host even when you are offline. Note: CIS program updates can also be checked manually. Click More Options > Check For Updates if you wish to update manually. Click here to view the help page on manual updates.